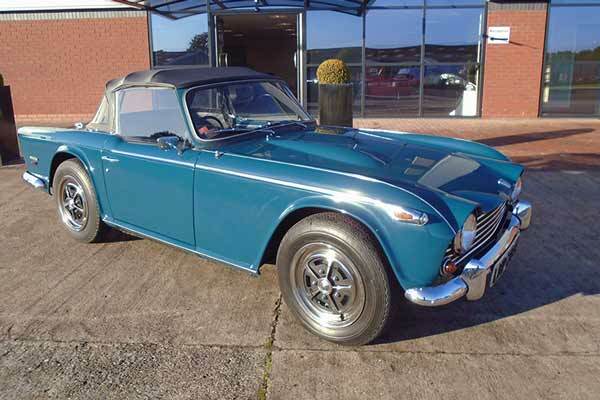 The first production Triumph TR5 for sale at classic car restorers Classic Motor Cars. This right hand drive TR5 Roadster was the first TR5 P1 that Triumph built on the normal assembly line in 1967. Manufactured on the 29th August 1967 by Standard Triumph Motor Company Limited, the car is one of only 1,100 examples built. TR5 production only lasted 13 months, between August 1967 and September 1968. Under the bonnet sots a 2.5 litre straight-6-fuel-injected engine, developing around 145 hp. 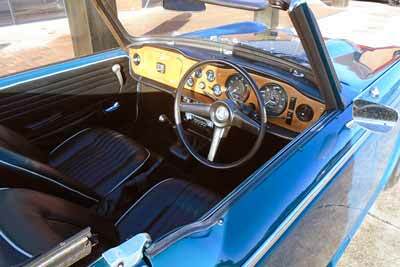 Fuel injection was very rare among road cars in 1967, causing Triumph to claim that the TR5 was the “First British production sports car with petrol injection”. This car started life as Triumph’s press car before going on to star under the bright lights of the Earls Court motor show in London that same year. The car is unique both inside and out, boasting an interior that has been upheld to an impressive standard over the years. The car’s mechanics have been rebuilt using only genuine Stanpart parts where needed. All the parts that have been replaced over time are accompanied by their respective documents, confirming their authenticity.